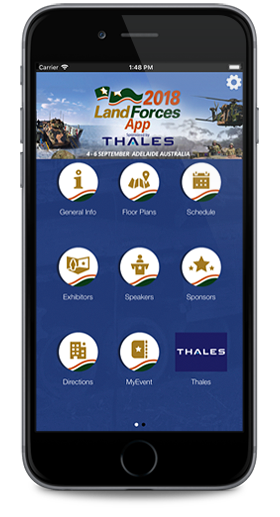 As part of LAND FORCES 2018, trade visitors, conference delegates and exhibitors will have access to the LAND FORCES 2018 App sponsored by Thales, designed to enhance networking opportunities and help gain the most out of the event experience. The LAND FORCES 2018 App is available as a free download to all smartphone users. The LAND FORCES 2018 App contains up-to-date event information including floor plans, stand locations, exhibitor profiles, sponsor profiles and the LAND FORCES 2018 trade directory as well as conference and associated functions schedules. Exhibiting companies will be listed in the App as part of an online trade directory with company information and contact details available to exhibitors and trade visitors at the touch of a button. To download the LAND FORCES 2018 App go to either iTunes or Google Play stores and search for LAND FORCES 2018. Make sure you allow notifications for any last minute updates and amendments to the schedule.